This Mother's Bangle Bracelet has so many options to show off those you love. 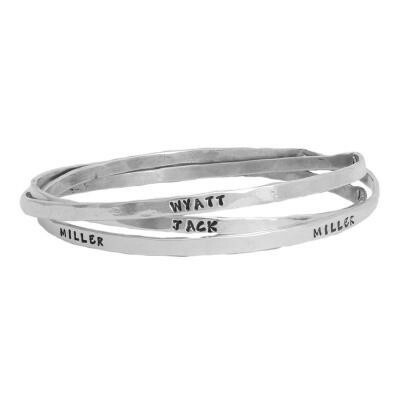 Put the same name three times on each bangle or put up to nine different names, words or dates. We are in love once again. The simplicity of this bracelet speaks volumes. Stamp up to three names or words on each bangle and create a piece that will warm your heart every time you look at it. The three bangles are interconnected to symbolize the bond of the family. The bangles are connected permanently with a brass rivet. The most common is if you have three children, stamp each of the kids' names three times - each having their own bangle. You can also do first, middle and birth-date on each. Or add words such as LOVE, FAMILY or BLESSED. You could also add your pets' names...they are family too. Each bangle will be stamped three times. We can allow for 12 characters/spaces per stamp. The stamps will be equally spaced around each bracelet. Bangle is approx 3mm wide. All silver is sterling and rivets are brass. This is a triple bangle bracelet and does not have a clasp, it slides over your hand and onto your wrist. We are unable to change the size of the bangles once they are ordered so please be sure to order the correct size. We STRONGLY suggest that you view the video below (in the tab below) and print out the bracelet sizing guide to help you determine your size. Please make sure you print the page at 100% (do not scale page or the measurement will be incorrect). Sorry ~ we cannot stamp on the inside of the bands. We only use sterling silver, 14K gold, gold vermeil, gold filled and bronze in our products.